Orlane Crème Royale Active Lotion, 4.3 oz. OrlaneCrème Royale Active Lotion, 4.3 oz. Exceptional Anti-Aging Care. Skin is moisturized, more relaxed, and softened. The lotion enhances skin efficiency. Skin is revitalized and toned, prepared for the action of Crème Royale anti-aging program. Skin regains softness and radiance of youth. A powerful cell energizer, it is the first essential beauty step in your beauty care ritual. This rich and fluid lotion plays a fundamental role in maintaining youthful skin and activating its beauty. A Rich and luxurious texturetransparent and fluid, rich in touchgets a real pleasure for the skin and provides immediate comfort. Prepares the skin for the action of Crème Royale anti-aging program and enhances their effectiveness. Opens the doors of cells to the Fresh Royal Jelly and 24-Carat Gold. Creates an ideal moisturizing bath for cells and their environment, promoting their communication and their fundamental activities. Stimulates the natural defenses and the skin's ability to repair. Protects the skin from aging and strengthens its youth. 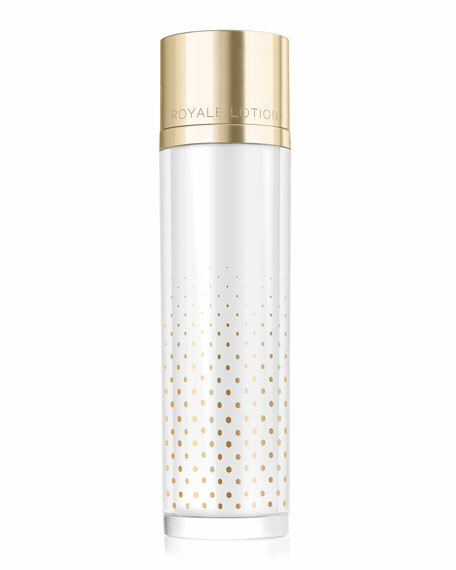 Contains Fresh Royal Jelly, delivering it in fresh formensuring the integrity of its active ingredients, along with its anti-aging properties, is preserved. 24-Carat Gold helps with skin's defenses. Its detoxifying, anti-inflammatory properties and insulating ability help protect skin against stressors and free radicals. A moisturizing complex absorbs, retains and diffuses water molecules for immediate, continuous moisturization. It acts like a conductor to pull and diffuse active ingredients deeply into the skin. After Cleansing the skin, apply with fingertips all over the face. Follow with usual Serum or Cream. Help combat breakouts and reduce the appearance of redness, irritation and minor skin eruptions with this talc-free overnight drying lotion.